Have you ever found a live page on your site that you thought you had deleted? Perhaps the content is out of date. You log into Cascade to delete the page again only to find that the page is not there. What happened? This is referred to as a ghost page. It is a page that previously existed on your site, but was deleted without being unpublished from the web server. Every time a page is published, its impression will remain on the website unless it is unpublished. Ghost pages must be removed from the web server by the web team. Email wmd@brandeis.edu with the URL of the ghost page and a member of the web team will remove it. Ghost pages occur because a page was not unpublished before it was deleted. In the CMS, we have a check box that must stay checked in order to unpublish content. 1. When you need to delete a page, select it from the Site Content panel. Click More, then Delete. 2. 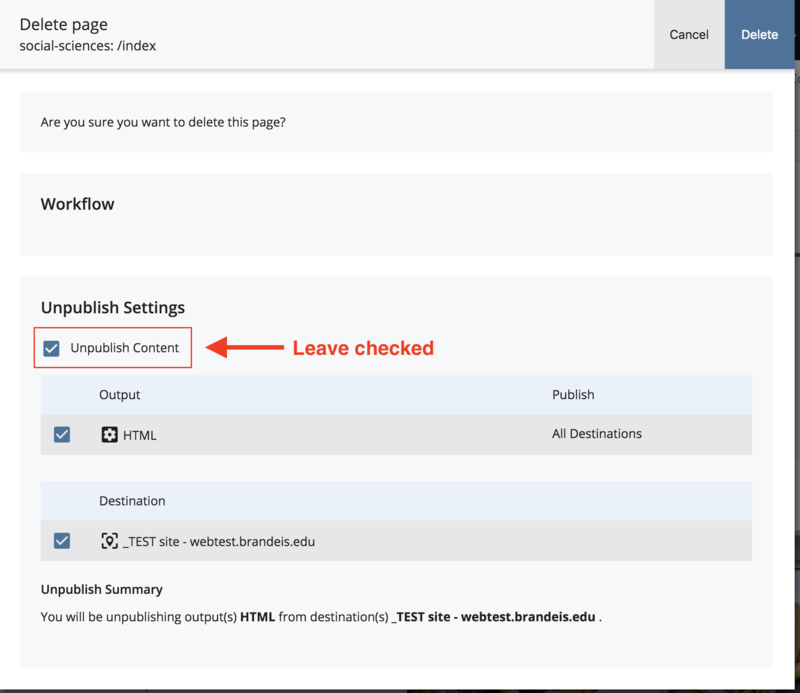 Leave the box checked next to Unpublish Content. If you uncheck this box, you will create a ghost page — so leave it checked. Click Delete.